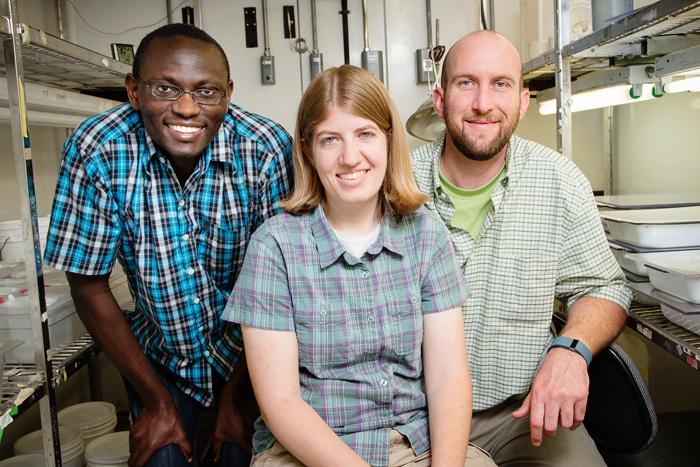 Researchers, from left, Ephantus Muturi, Allison Gardner and Brian Allan found that different types of leaf litter in water had different effects on the abundance of Culex pipiens mosquitoes, which can carry West Nile virus. CHAMPAIGN, Ill. — A new study looks at how leaf litter in water influences the abundance of Culex pipiens mosquitoes, which can transmit West Nile virus to humans, domestic animals, birds and other wildlife. The study found that different species of leaf litter in standing water influence whereCulex pipiens mosquitoes deposit their eggs, how quickly the larvae grow, how big they get and whether they survive to adulthood. Because the mosquitoes feed on bacteria that grow on leaf litter, the team also measured how native and non-native leaf species influenced bacterial abundance and diversity. The study is reported in the journal Parasites and Vectors. When added to standing water, the leaves of two non-native, invasive plants, Amur honeysuckle (Lonicera maackii) and autumn olive (Elaeagnus umbellata), yielded significantly higher numbers of adult mosquitoes than other leaf species did, the researchers report. “The invasive honeysuckle was definitely the highest quality habitat in terms of the adult mosquito emergence rates, even when you had very high densities of the larvae,” said graduate student Allison Gardner, who led the research with University of Illinois entomology professor Brian Allan and Illinois Natural History Surveyentomologist Ephantus Muturi. The INHS is a division of the Prairie Research Institute at the U. of I. A third invasive plant, multiflora rose (Rosa multiflora), was associated with low numbers of eggs laid and low survival of the larvae, the researchers found. The team also made an unexpected, but promising, discovery: One of the plants studied, a native blackberry (Rubus allegheniensis), seemed to encourage Culex pipiens mosquitoes to deposit a lot of eggs on the water’s surface – but very few of the resulting larvae survived to adulthood. “The blackberry was one of the most attractive habitats to the mosquitoes, but also one of the lowest quality habitats in terms of the larval survival rate,” Gardner said. This finding could lead to new, biological methods of controlling Culex pipiensmosquitoes, he said. Some invasive, non-native plants enhanced Culex pipiens mosquito abundance, increasing the risk of West Nile virus transmission. Some native plants had the opposite effect, researchers found. See FULL infographic. The team also analyzed the bacteria that colonized the different leaf types. “We wanted to understand the mechanism by which plants differ in their ability to support mosquito oviposition, development and survival,” Muturi said. Sites with more bacterial diversity had higher numbers of mosquito eggs than those with less diversity, the researchers found. But bacterial abundance, not diversity, was associated with better larval survival. This finding could explain the unexpected role of blackberry leaves as an ecological trap, Muturi said. Blackberry leaf debris in water hosted a high diversity of bacterial species, but bacterial abundance was rather low, giving the developing larvae little sustenance. Future studies will explore whether blackberry leaves can be used to undermine the viability of disease-carrying mosquitoes, Allan said. In the meantime, those working to stop the advance of invasive plants like honeysuckle and autumn olive have another reason to do so, Allan said. The U.S. Environmental Protection Agency, the Institute for Sustainability, Energy and the Environment at the U. of I., and the Illinois Used Tire Management Fundsupported this research.